Yay! We're going for 2 dates after all. Tues 23 May, 7-9pm Granta Bar (ground floor of the University Centre/Grad Pad/most attractive modern building in Cambridge, ahem). Sat 27 May, 2-4pm Grads Cafe (top floor of aforementioned arhcitectural triumph). June promises to be even more exciting with Mary's punt'n'knit plus a return to the Cambridge Blue for the evening KTog. The idea has become fixed in my mind: We must get a bunch of knitters into a punt and go slowly along the river, yakking and trying not to poke each other with our needles. I'm leaving town mid-July, and weekends are fast filling up, so June 24th looks to be the perfect time for me. 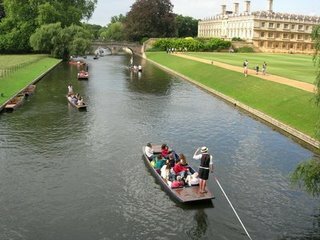 Who's on board for the First Annual (or Once in a Lifetime) Cambridge Punt 'n' Knit? Mark your calendars! Next Knit Together will be on Saturday 27 May, 2-4pm at Grads Cafe, University Centre (aka the Grad Pad), Granta Place, off Mill Lane. Everyone welcome. Does anyone fancy going to the Hip Knits open day in Sawbridgeworth on Saturday? I'm planning to drive if anyone's interested in coming with me.